Tomorrow is the ONLY Saturday we won't be at the YMCA for practice. We will be in the Spirit of Christmas Parade for Butler Light Up Night. If you can't wait that long, we'll be at The Wheel Mill on Friday Nights. Rumor has it there may be some uni hockey in the works the first or second Friday of Dec. It's about that time of year again. Daylight Saving Time kicks in this Saturday. Looking for something to do to stay moving? Interested in staying warm? Every thought of riding a unicycle? Join us. We start our weekly meetings here in Butler, PA at the YMCA every Saturday from 4:30-6:30pm. If you have your own uni- great! If not, no problem- we have extras. 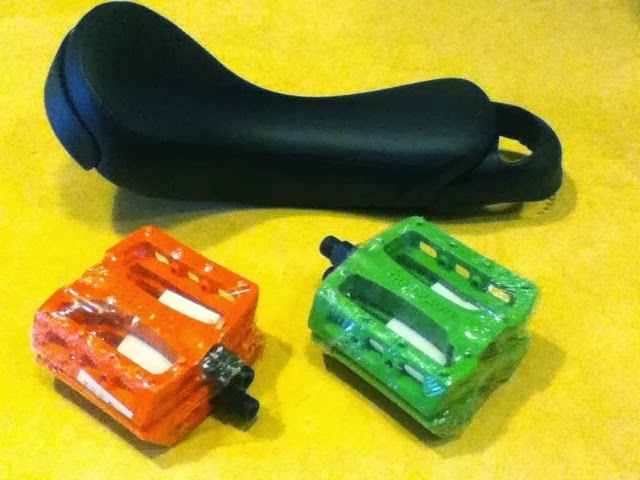 You will need to wear a helmet (we have extras of those too, but you should bring your own). You will need to sign a release too (parents need to for those under 18). 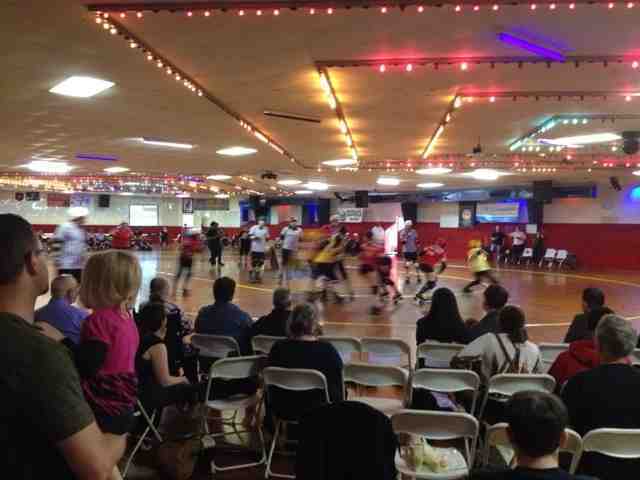 We welcome all ages- especially 12 and up. For those under 12 we often accommodate, but a parent will have to stick around while we practice. So Mom and Dad you might as well give it a try! 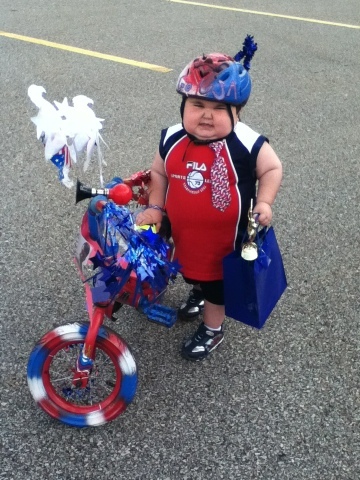 Unicycling is for everybody. It's fun. It's relatively safe- on a 20", you're about as high up as standing on a stair. If this isn't your first time to our site, you've heard all of this before. The message hasn't changed. What has, is our schedule- just a bit. In addition to Saturdays at the Y, we're going to be at The Wheel Mill in Pittsburgh almost every Friday night throughout the Winter, starting Nov. 8th. Both the Y and The Wheel Mill can accommodate all levels of riders, but the Y is a gym, and The Wheel Mill is an indoor mountain bike (and uni) park. Trust us, it's totally doable. We LOVE the Y and will never leave. However, we also hope to see the sport of unicycling move forward. 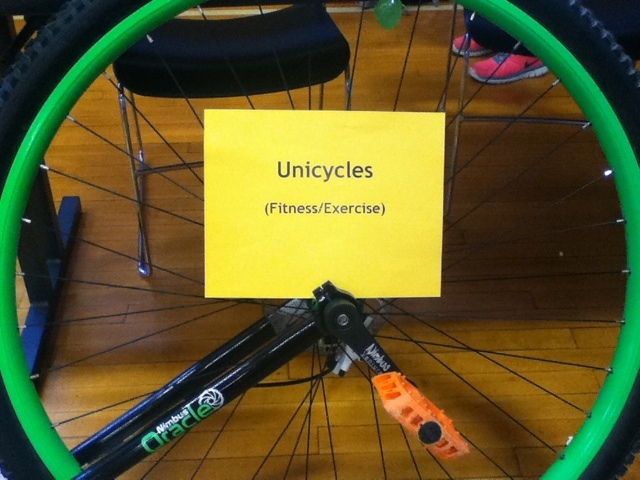 Part of that entails raising awareness that unicycles aren't just for the circus and parades. We need more off road riders. It's a skill that can be learned. Ask any of us. NONE of us were riding 10 years ago- much less off road. We just wrapped up another successful Month of Mud series- this one with the most unis EVER! Isaac completed his second full series, and Kevin his first. With Dave, that makes 3 total full series riders (and a couple who made part of the series). We can add an official unicycle class if we have 5 total. That would really change things- for the better. 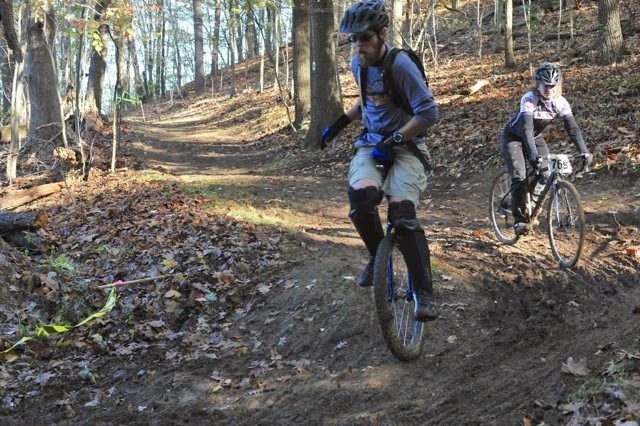 That would make us part of the first mountain bike racing series- at least in the Mid-Atlantic/ East Coast region- that has a unicycle class. So, join us at the Y. Learn to ride. Then head outside. Note: We won't be practicing indoors on November 9th due to a basketball tournament. We're back on for the 16th. The pic above is from our first NAUCC 2013 promotional stop at the Carnegie Science Center. A raging success- not just because we got to ride our unis around the Center, but because we piqued the interest of attendees. 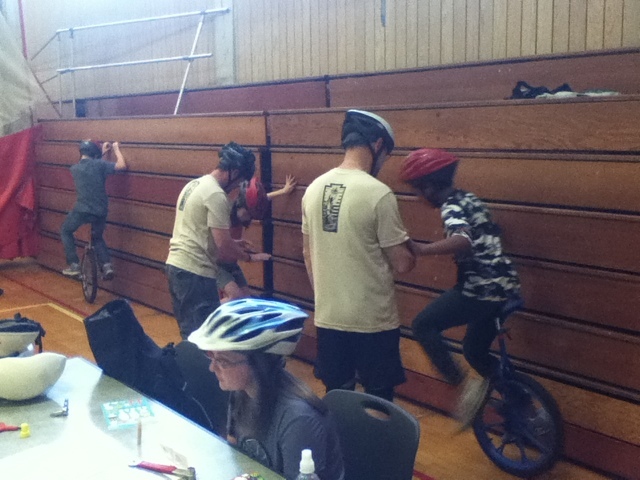 Speaking of that, we had over 80 people sign the waiver and try unicycling for the first time. Instagram was busy that night. Over 2 Night + BIKES exhibit + unicycles = Good times. 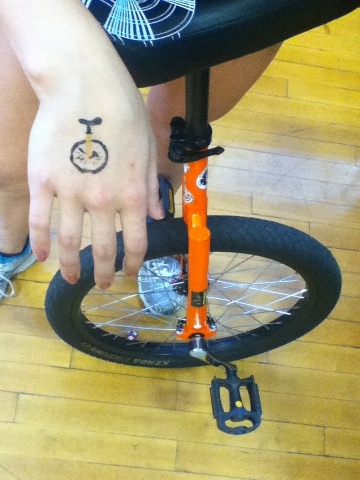 As you can see, we're aiming to spread the word that unicycling is fun and you can do it if you want to. 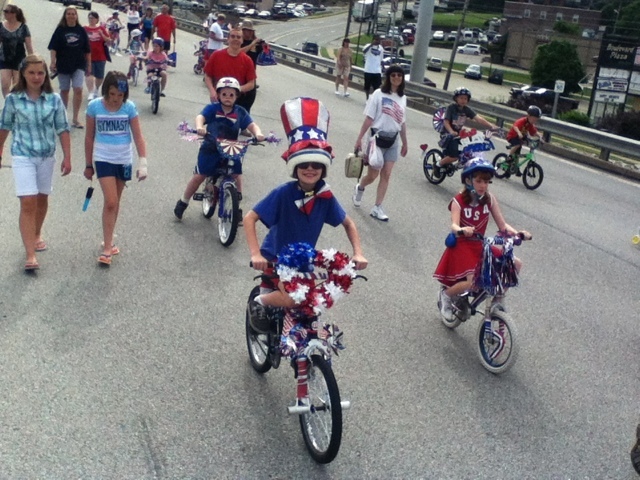 Our next appearances are at the Miracle Mile parade with Pro Bikes on July 4th- with another appearance on the Butler Freeport Rail Trail at the new stop in Herman. We'll also be at the Science Center again on July 6th. It's all about this: www.uninationals2013.com. July 21st-27th. That's where the real fun will be! We've always dreamed of a place to brush up on our off road chops regardless of the weather. Now it exists. The Wheel Mill is Pittsburgh's indoor mountain bike park. 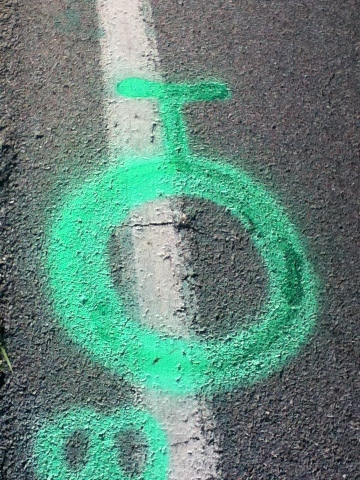 And, thanks to Harry and crew, unicycles are welcome too! So, what better way to celebrate this than a weekly uni gathering there? That's right, mUni Mondays are BACK! Who's it for? EVERYONE! We're looking to increase unicycle ridership in the region. 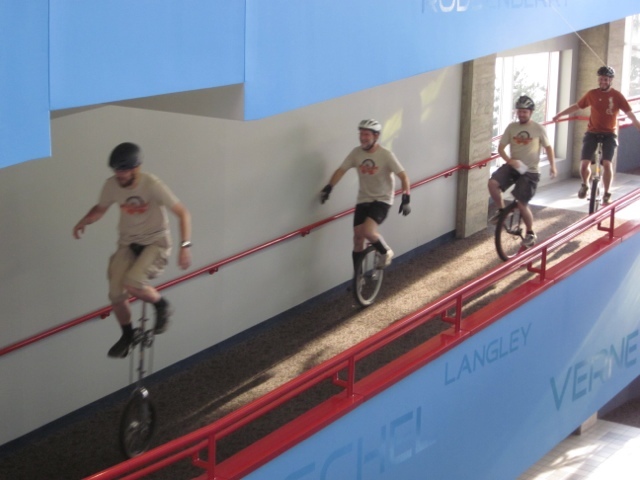 By now you may have heard that the North American Unicycling Convention and Championships are going to be right here in Butler County from July 21-27 2013. We want to celebrate this event and encourage people not to give up their bikes, but to expand their horizons. 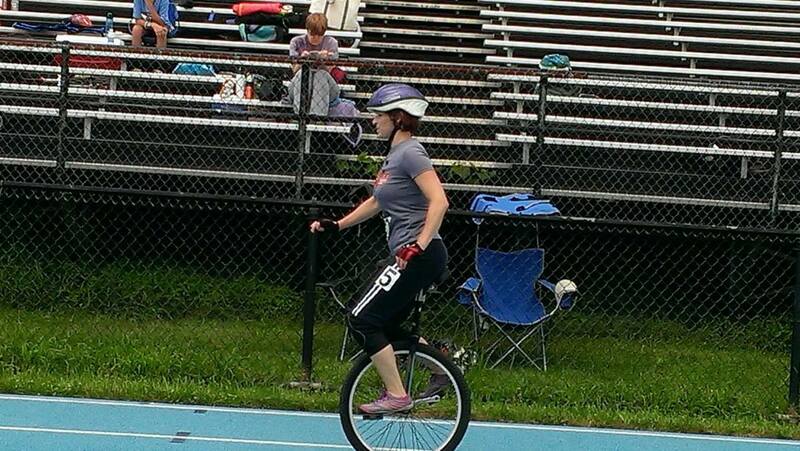 Unicycling is fantastic for balance and core strength- necessary attributes for biking as well. As a matter of fact, their great skills for most humans to possess in spades. 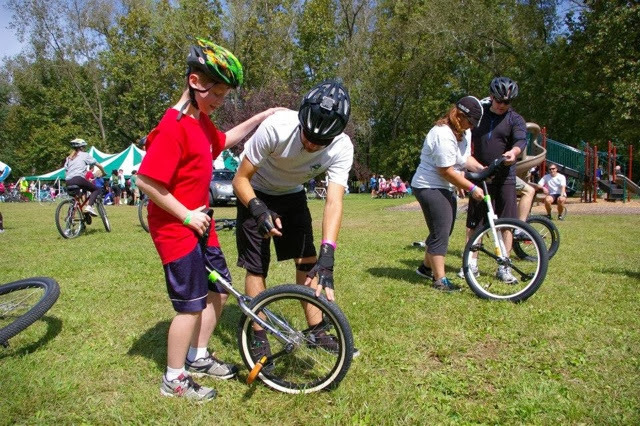 We want to give people the chance to try unicycling and brush up on their chops as well. 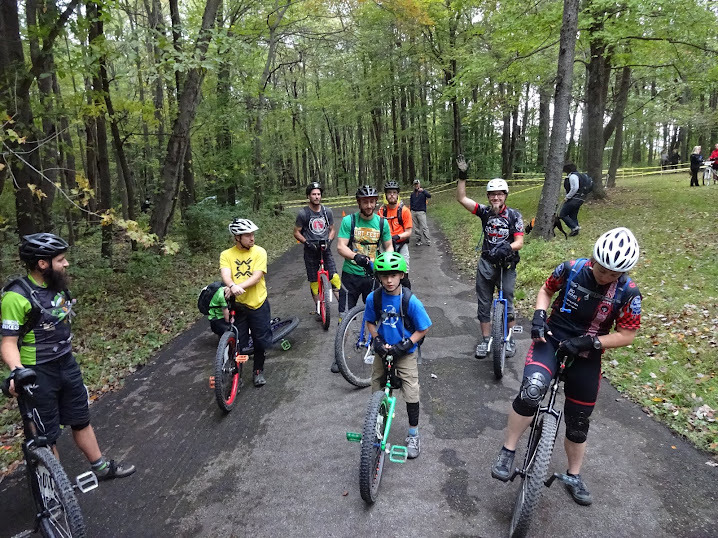 We're joining forces with the crew at THICK Bikes and the Wheel Mill to give you the opportunity to try unicycling in a supportive environment. We'll bring some extra unis- but not enough for the entire population of Pittsburgh. If you have your own, bring it. You need to bring a helmet and a bit of cash for admission. Whether you're just curious or a seasoned veteran, it's all good. We're intentionally making mUni Monday part of Shame Free Mondays at the Wheel Mill. Find out more at their Facebook link. Now for the facts: mUni Mondays will be Mondays (yep.) from 7-10pm (close) starting June 10th and going throughout the Summer (except for July 22nd). The Wheel Mill is graciously offering $6 off of admission as a "Come try the fun of one" stimulus package (it makes it $10+ tax at the current rates). We're not charging extra for borrowing a uni for the night, so that makes it too good to pass up, right? Please note: Standard Wheel Mill rules apply. Check their admission policies-especially for minors. We will be more than happy to take a bit of time to show you the ropes if you've never been on a uni before. There isn't a formal class and if you miss some weeks or show up late (or leave early) it's no big deal. We hope to have all levels of riders in attendance as The Wheel Mill is a perfect venue to session for Beginners to Experts. If you ever thought of trying one wheel, this is a great chance to give it a go. As far as safety goes, wear a helmet, and we'd recommend gloves shin guards or knee pads too. In the 4 years we've been teaching people to ride we've had very few injuries- not that it can't happen, but unicycling is mostly safe. Watch us ride for a bit if you like. Above all else, remember the #1 reason for unicycling: IT'S FUN! Here's a quick video of a typical Saturday session. What's been exciting this season (since October) is the number of new learners we have joining us. That's good, because next Summer, NAUCC 2013- the North American Unicycling Convention and Championships are in the County. There's still time to learn between now and then. We say it time and time again, but unicycling is a blast. We can teach you to ride FOR FREE! Oh yeah, if you take a look off to the right, you'll notice our Page listing has been growing. We've added some video tabs. Enjoy! It's no secret we like to ride unicycles. We also hope it's not a secret that we think you should try it too. Unicycling is a great is great for core strength and balance- something almost every human needs. As always, this is the plug: Join us (indoors!) 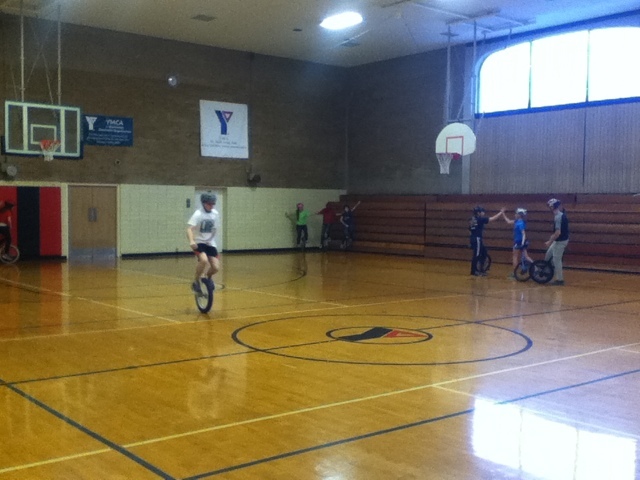 at the Y on Saturdays from 4:30-6:30pm to try unicycling for yourself. 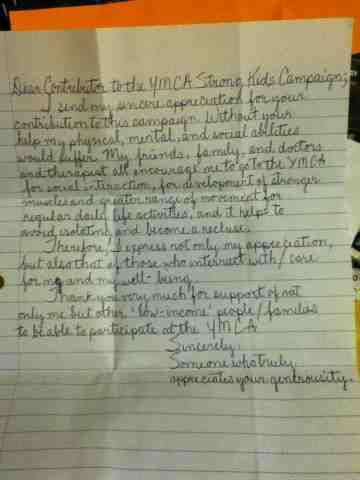 It's totally free- no charge to get into the YMCA and no fee for the class. Caution: many who try unicycling find that they like it. We're REALLY pushing it this year as there are a few up and coming events that are really exciting in 2013. 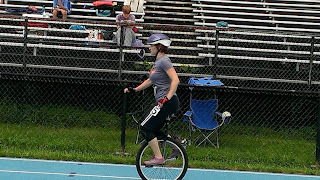 First, THE unicycling national convention, NAUCC 2013, IS IN BUTLER COUNTY THIS JULY! Yes, those are capital letters for emphasis. If you miss it, even as a spectator, you will regret it. If you can ride a uni, you should register (when the time comes) and attend. We expect 300+ people and a lot of WORLD Champions to be in attendance. Can you imagine seeing someone hop over 4 feet high on a unicycle? How about ride at close to 30mph? What about play hockey or basketball on a uni? It's a big deal. This is the first time EVER the national convention has been in PA.
What other sport can you hang out with the top names in the sport for a week? Enough about that for now. 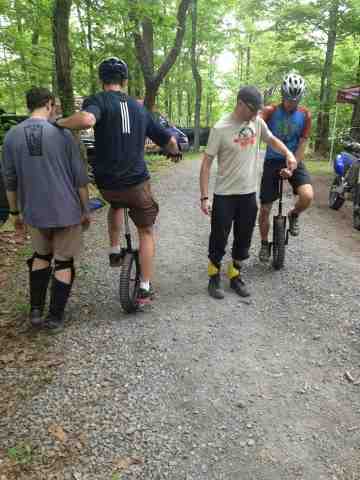 On to the next exciting event: The 6 Hours of Brady's Run mountain bike race has a unicycle classes. It's definitely not something for beginners, but it is going to be a lot of fun. I've been racing Brady's Run as part of the Month of Mud series for the past 10 years, and it's always been one of my favorite courses. It's very challenging, but ride-able on both 2 and one wheel- for Advanced and Expert level MUni riders. The fact that there's an endurance race less than an hour away is something to get REALLY EXCITED ABOUT! We'll be attending Dirt Fest again this year too. This event is not a race. 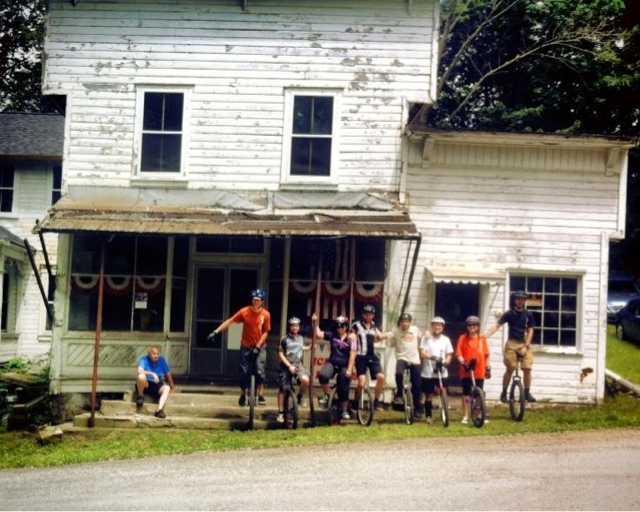 It's a chance to camp and hang out with some cool people and ride great trails in Raystown Lake, PA. There will be other events that we'll be attending too. As always, you're welcome to join us. 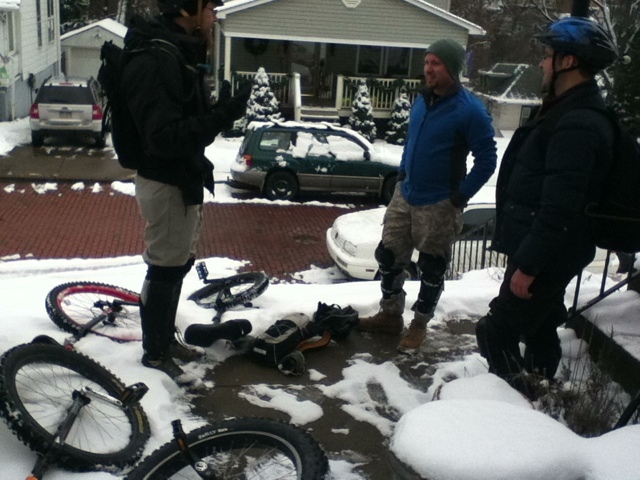 The unicycling community is a great group of people. Show up at the Y on a Saturday and find out! Oh yeah, if you join us this week, we'll be heading out to dinner at a local restaurant after our Y time. Join us.